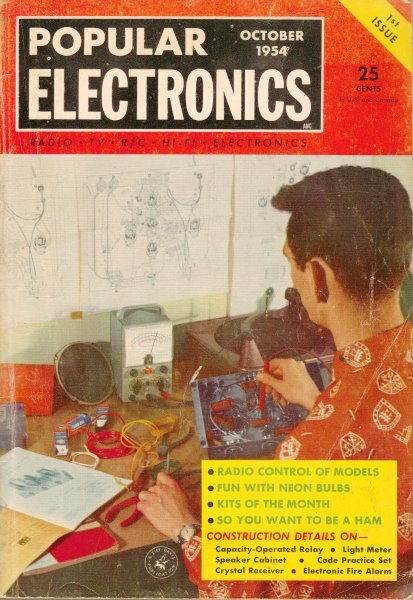 A timeless introduction for newcomers to electronics, this article in the 1954 Popular Electronics presents the basics of what a capacitor is and how it works. A capacitor-or electric condenser, as it was once known-is a device for storing electrical energy and returning it as desired. It has storage space - i.e., capacity for electricity; hence, capacitor. Basically, a capacitor consists of two plates or systems of material that are capable of conducting electricity, separated by an insulating material. The oldest man-made capacitor of record is the Leyden jar, a glass bottle whose inner and outer surfaces were covered with copper foil. Invented in Holland in the mid-18th century, it was first used in America by Benjamin Franklin in his classic experiments with natural lightning. These Leyden Jar condensers and the glass plate condensers which succeeded them were used in the early spark wireless sets. Today's capacitors usually use aluminum foil electrodes or plates, although Invar steel, copper, and tantalum plates; lead, copper, and tantalum foils; as well as thin zinc and silver films are in use for specialized applications. The dielectric or insulating materials may be paper impregnated with an oil or wax, electrolytically formed oxide films, plastic films, ceramics, glass, air or a compressed gas. The combination of electrodes and dielectrics may be a rolled assembly such as the ordinary "tubular" paper capacitor; a fixed or adjustable mechanical plate structure; a disc or hollow tube; a stacked series of plates or wafers; or a series of coaxial cylinders. Capacitors are essential components in electronic and electrical circuits. They are used everywhere in our modern electrical life - on power lines, TV and radio sets, in automobiles, in aircraft, in fluorescent lamps, electric refrigerators, air conditioners, oil burners, etc., etc. One capacitor manufacturer alone - Sprague Electric Company - has made well over a billion capacitors in the last 25 years. Where do they go? Well, remember that a table model radio uses about 15 and a table model television set about 115. Among the basic uses of this important circuit component are the suppression of sparks across contacts as in auto distributors and fluorescent starters; filtering or bypassing unwanted radio and TV signals; coupling electronic circuits together; tuning circuits; reducing "waste" circulating currents by improving "power factor"; suppressing radio and TV noise; supplying electrical energy for conversion to light in "pulsed photographic lighting systems"; and "phase splitting" or .changing the nature of alternating current electricity supplied to motors used with various appliances. This informative message is No.1 of a Series contributed by Sprague, the world's largest manufacture of capacitors. Write Sprague Products Co., N. Adams, Ma. , for complete Sprague catalog.